Interlaced Up and Down Buttonhole is an interesting variety of buttonhole that consists of two rows worked interlaced as you work them back to back. It forms really attractive band that is ideal to use on a border, a seam decoration on a crazy quilt or if you work it row upon row it makes a very nice fill too. You can also add beads for extra zest. You need to be familiar with Up and Down buttonhole stitch to work this. You first work a row of up and down buttonhole stitch then the interlacing is done on the second row. Starting as you would with buttonhole work the first stitch of the pair as a regular buttonhole stitch with your needle pointing downwards wrap the thread under the needle and pull the needle through. For the second part of the stitch, insert the needle and take a bite of the fabric so that the tip of the needle is pointing upwards as illustrated. 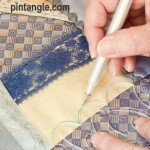 Wrap the working thread under the needle and pull the needle through the foundation fabric. As you pull the needle through pull the needle towards you instead of away from you. As you do this hold down the loop that forms with the left thumb to prevent it slipping.The loop forms as you stitch. Note I have noticed online that some instructions create a loop then lace the working thread through the stitch. This is wrong the loop is created as you stitch and once you have the rhythm of the stitch it is easy and quick to do. This loop forms the bar at the base of both stitches. This forms the first pair of tied stitches. To commence the second row bring your needle from the back so that the thread emerges just above the line of the first row. Thread the needle under the first bar on the first row, that you have just created. At this stage you are going under the thread but not through the fabric. Work a pair of up and down buttonhole stitches. Thread your needle under the next bar and work a pair of up and down buttonhole stitches. Continue along the line threading your working thread under each that is between each pair of stitches on the bottom row. I have worked the two rows in different colours so readers can see how the two rows are laced together. As you can see you could incorporate beading with this stitch very easily. This is a great, great stitch! Yes Queenie I enjoyed it too! This stitch looks great, I’m looking forward to give it a try. Today I wrote about a CQ birthday card with TAST stitches, a great excuse to try TAST stitch 127 on rickrack! Great stitch! I like it with the single color and two. Perfect to build upon with other stitches too! I guess I need to find a place to post pix one of these days. I look forward to trying this stitch out! Your examples are gorgeous.